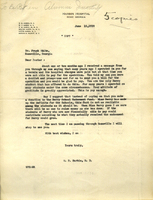 In this letter W.P. Harbin thanks Dr. White for paying what he owed for his surgery. W.P. Harbin says that he has operated on many Berry students, but Dr. White was the first to pay him.